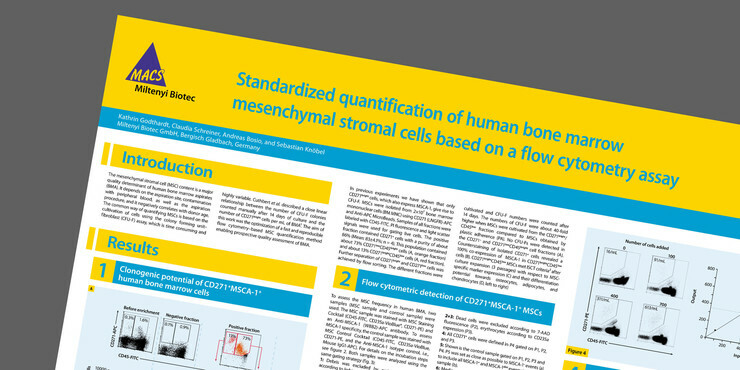 The MSC Enumeration Kit was developed for the standardized, quick, and absolute quantification of human MSCs from fresh bone marrow aspirate by flow cytometry. It takes only 30 minutes and requires only 200 µl of bone marrow sample per test. 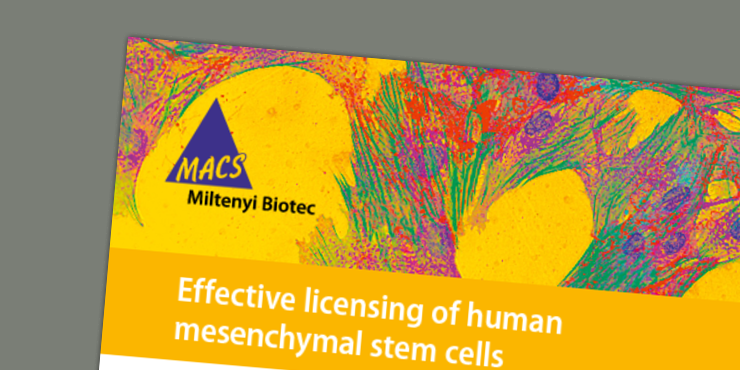 The MSC Enumeration Kit, human provides a cocktail of 3 fluorochrome-conjugated antibodies that are used to identify MSCs, These include the MSC-specific marker CD271 (LNGFR) and exclusion markers CD45 and CD235a. 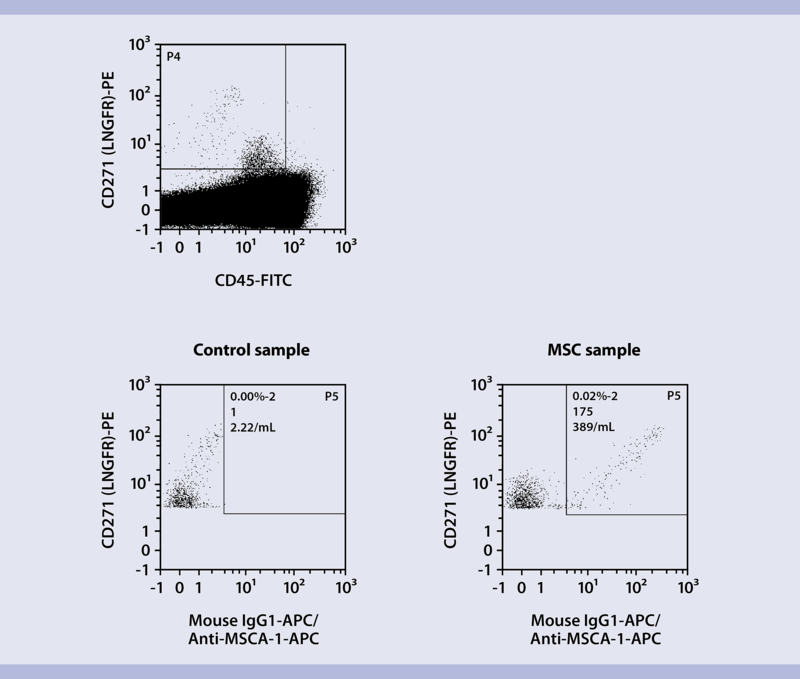 Anti-MSCA-1 (W8B2) is provided separately in the kit and can be added to specifically identify MSCs with high proliferative potential. Bone marrow aspirate (100 µL) was labeled using the MSC Enumeration – Staining Cocktail. After red blood cells were lysed, remaining cells were analyzed on the MACSQuant® Analyzer 10. 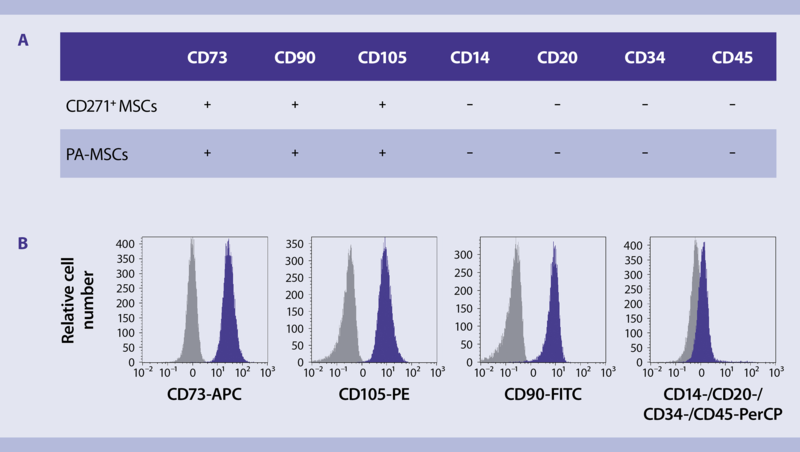 Viable leukocytes were gated for CD45 and CD271 expression (A). 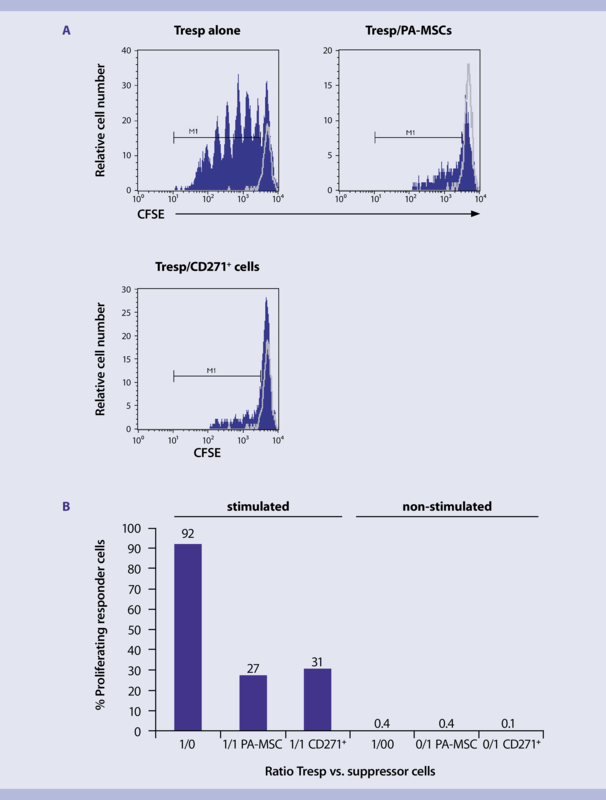 This population was then further analyzed for Anti-MSCA-1 expression (C). Gating was performed according to the corresponding isotype control in B. Historically, a number of methods relying on specific physical properties have been used to isolate MSCs from sites at which they reside. 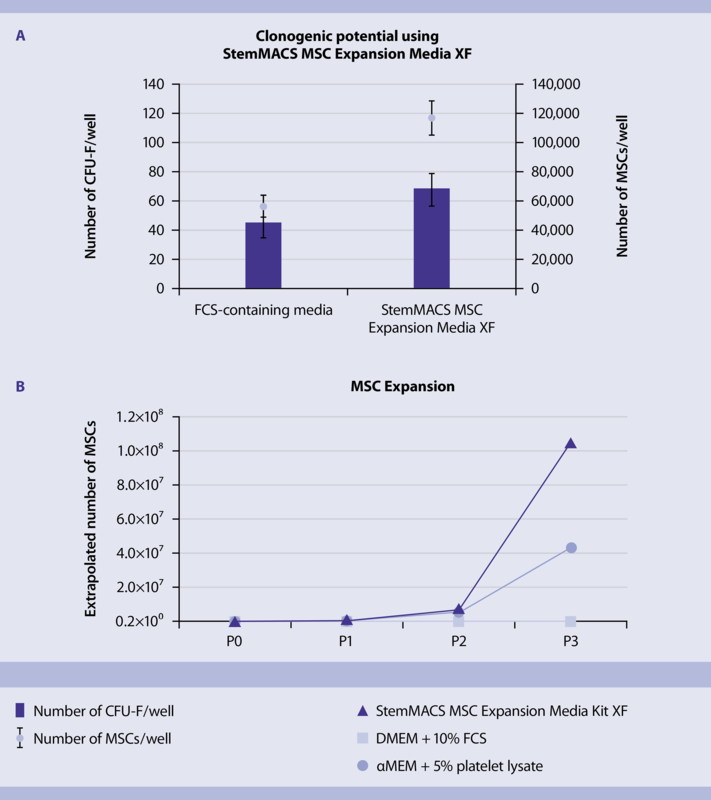 The problem with this type of approach is that no physical properties have been uniquely ascribed to MSCs. Therefore, many different cell types are co-isolated, resulting in a mixed population of cells. Magnetic cell isolation (positive selection) of CD271 (LNGFR)+ cells results in a cell population containing an approximately 1000-fold greater concentration of MSCs as compared to conventional methods of isolation. This enables isolation of a homogeneous, and consequently more effective non-hematopoietic stem cell population. CD271 MicroBead Kits were developed for the isolation of CD271 (LNGFR)+ MSCs from bone marrow or adipose tissue with high yield and purity. The Anti-MSCA-1 (W8B2) MicroBead Kit was developed for the isolation of MSCA-1 (W8B2)+ MSCs with high proliferative capacity from bone marrow aspirates.